Norwegian Cruise Line has celebrated a major construction milestone for Norwegian Bliss, the first ever custom-built ship for the ultimate Alaska cruising experience. 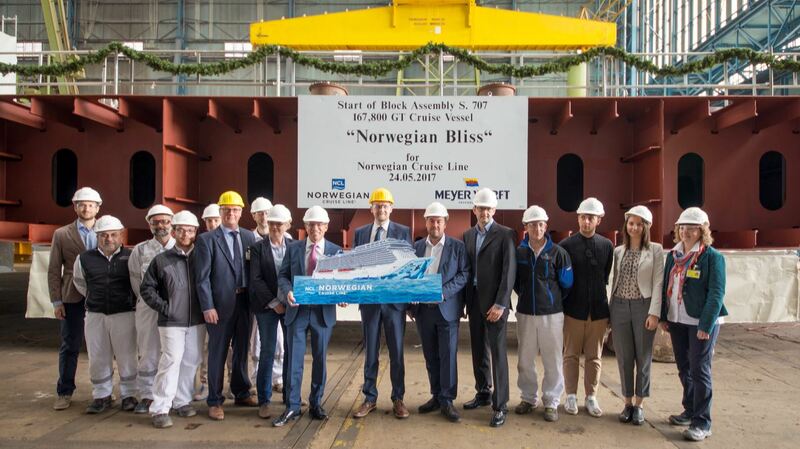 Afew months after cutting the first steel for their new cruise ship Norwegian Cruise Line and Meyer Werft have celebrated the keel laying of Norwegian Bliss at the shipyard in Papenburg, Germany. During the ceremony, the first of 90 blocks that will comprise the 167,800 gross ton vessel was lifted into the covered building hall, officially marking the start of the ship’s assembly. Norwegian Bliss is due for delivery in April 2018 and will be the first cruise ship custom built with features and amenities for the ultimate Alaska cruise experience. Andy Stuart, Norwegian Cruise Line’s President and CEO, laid the traditional “lucky coin”, etched with the outline of the ship’s signature hull designed by wildlife artist Wyland, before the block was lowered into place. The third ship in the line’s Breakaway Plus-Class, Norwegian Bliss will accommodate 4,000 guests and will be the 12th ship in the Norwegian Cruise Line fleet to be built by Meyer Werft. 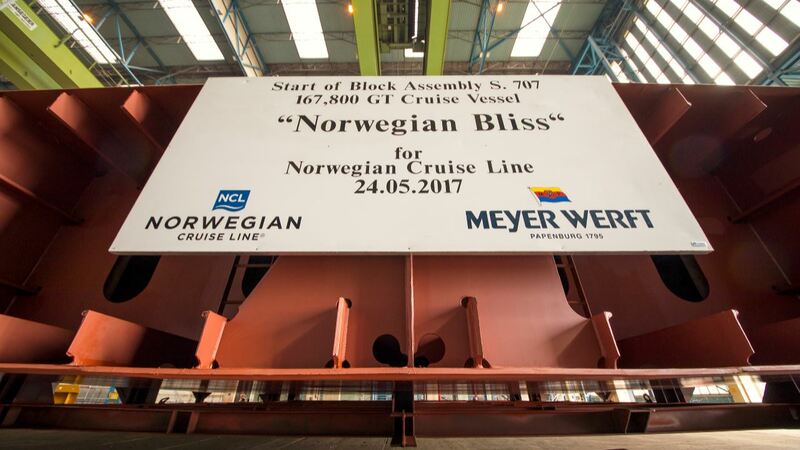 “We are very happy to celebrate the start of the block assembly for another newbuild with Norwegian Cruise Line. 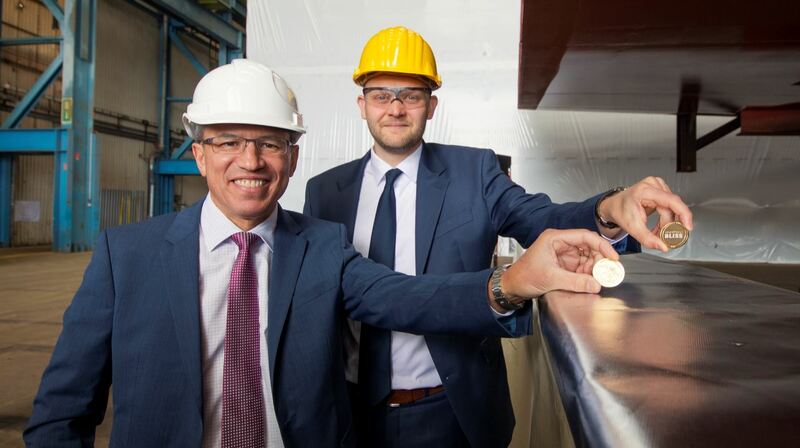 This ship will be another milestone in our collaboration to create most efficient and innovative cruise ships”, said Tim Meyer, Managing Director of Meyer Werft. During her inaugural summer 2018 season, Norwegian Bliss will sail weekly seven-day Alaska cruises each Saturday from the recently expanded Pier 66 Cruise Terminal in Seattle, offering guests the premier way to see America’s last frontier, while also providing all of the innovative features, entertainment, signature dining and on-board experiences that Norwegian Cruise Line is known for around the globe. The ship’s itinerary will feature calls in Ketchikan, Juneau, Skagway and Victoria, British Columbia, along with scenic glacier cruising.